The Futsal Whites have competed well with one of the best teams in the world, going down 7-3 to Russia in their second game of the CFA International Futsal Tournament in Changsha, China. The Marvin Eakins coached team, who were defeated 2-1 by a late winner from tournament hosts China in their opening game on Friday, rallied and delivered a superb performance against Europe’s top ranked team and the World No 3 last night. It was the first time the Futsal Whites had competed against a European opponent and they acquitted themselves well, putting their higher ranked rival under pressure in the hot and humid conditions. Eakins was hugely encouraged by his team’s composure on their first tour to a non-Oceania country. “It was an unbelievable performance from the guys, but in saying that, at half time we wanted to come out and win the game,” says the 33-year-old. The game was played at a high intensity right from the opening whistle. Within the first 30 seconds, Brayden Lissington found himself one on one with the goalkeeper and forced a good save from the Russian. New Zealand did open the scoring minutes later when youngster Benji Lapslie found the back of the net on the end of a great ball from Dylan Manickum who picked out Lapslie at the back post. The Futsal Whites could have doubled their lead on the end of a dangerous counter attack but it was eventually shut down by the Russian defence. Russia worked their way back into the game and got back onto level terms with nine minutes to go in the first half. New Zealand continued to scramble hard in defence. Manickum, playing in his 50th international for the Futsal Whites, cleared the ball from the goal line in the 13th minute. A minute later, a split save from keeper Elias Billeh denied Russia a second goal. The European powerhouse finished the half strongly and showed their clinical quality in front of goal. In the 16th minute a strong shot across goal was finished back post for Russia to take a 2-1 lead. At the other end of the court Jordi Ditfort fired a low shot forcing the Russian keeper into action. The ball was deflected into the path of Lucas Silva who saw his shot saved and deflected for a corner. Russia held them out and then capitalized from a well-worked corner to take a 3-1 lead into the break. The Kiwis looked to start the second half the way they had opened the game. Stephen Ashby drove a shot far post which was just out of reach of Ditfort in the 23rd minute. 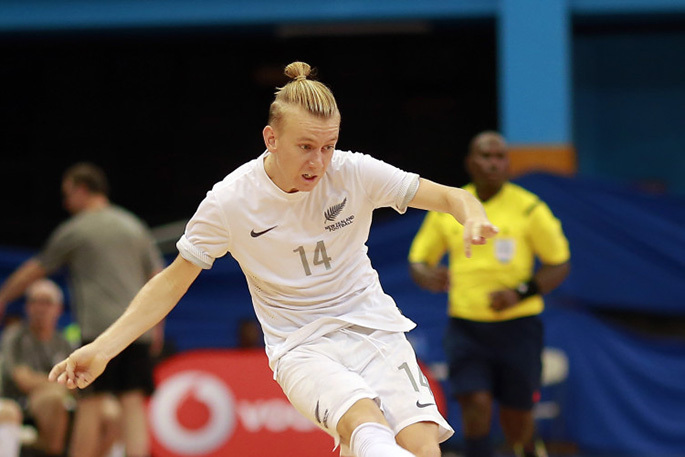 Russia again showed their ruthless edge when they scored two quick-fire goals, the second a long-range shot after breaking clear from the Futsal Whites’ high press, to jump out to a 5-1 lead. The score-line flattered Russia and the Futsal Whites were determined to prove that. They fought their way back into the game with consecutive goals. The first came on the back of a lay off from Tai Barham to sets up Luc Saker who calmly finished to get New Zealand back into the game. Soon after, Ditfort beat the last defender and found himself one on one with the keeper who could not prevent him finishing from close range. The Kiwis were back in the game and dreaming of an unlikely result against Russia but the favourites finished strong for a comfortable victory. Russia went 6-3 up when a powerful shot deflected off a New Zealand defender and ended up in the back of the net. Russia then made the most of a set piece to get to 7-3 up with minutes remaining. The Futsal Whites had one final chance to score when Stephen Ashby nut-megged a defender and fired a shot which rebounded off the post. It was the final chance of the game. The Futsal Whites showed huge quality and character to challenge one of the best teams in the world. They will look to build on this performance tonight in their final game of the CFA International Futsal Tournament when they take on Vietnam. Vietnam have also made a strong start to the tournament. After going down 6-2 to Russia in their opening game, they bounced back with a 4-0 win over China. Eakins is expecting a tough challenge in their final game as they look to finish the tournament on a winning note.